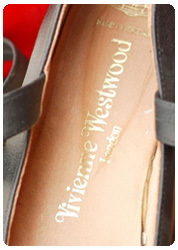 All our famous shoes are lovingly hand made in our traditional British factory from the finest Italian soft leather. The leather is non-toxic, environmentally friendly and safe for kids. They give total comfort to little growing feet. The natural soft leather upper has a durable non skid sueded sole and is great for bouncing, crawling, early walking and toe-sucking. Starchild Shoes are sold at top department stores such as Harrods in London, Harvey Nichols and Selfridges. We also sell in Tokyo, Paris, Washington and many more cities throughout the World. 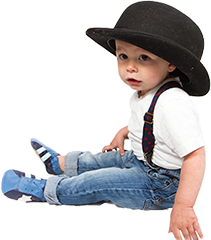 Starchild Shoes have graced feet of many mini VIPs, including offspring off Madonna, Liam Gallagher, David and Victoria Becham, Gwyneth Paltrow and many more. We are a member of anti copying in design which means all our shoes are designed registered. Other companies are copying us, so be aware of copycats! Allowing the youngster to go barefoot or to wear just socks helps the foot to grow normally and to develop its musculature and strength, as well as the grasping action of toes. Of course, when walking outside or on rough surfaces, babies' feet should be protected in lightweight, flexible footwear made of natural materials. Soft soled baby shoes allow the beginning walker to grip the floor, developing strong ankles and flexible foot bones. This creates a solid foundation for bone and muscle formation in the rest of the body, especially the spinal column. A level pelvis and straight spine depend upon healthy feet throughout our entire lives, beginning in infancy. Janet, managing director of Starchild Shoes Ltd began her career 20 years ago in London where she worked with Vivienne Westwood, Helen Storey and Nick Coleman. "Vivienne was amazing and the atmosphere at her design studios was electric. Working with her on famous pieces such as the 'Elevated Platforms' and the 'Rocking Horse' shoe gave me a breadth of knowledge of the industry". Janet designed shoes for Prince and Boy George. "In 1998 my priorities changes and I had a baby so made my first baby shoes...and Starchild Shoes was born."